Brian Burke, president and general manager of the Toronto Maple Leafs, announced Saturday that the hockey club has signed unrestricted free agent forward Clarke MacArthur to a one-year contract. 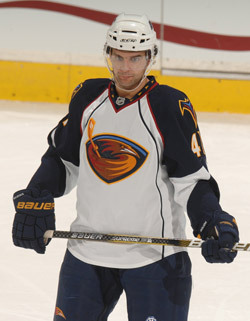 MacArthur, 25, began last season with the Buffalo Sabres before being traded March 3 to Atlanta in exchange for the Thrashers’ third and fourth round picks in the 2010 Entry Draft. In 81 games between Buffalo and Atlanta, he registered a career-high 35 points with 16 goals and 19 assists. In 2008-09, he scored a career-best 17 goals while playing in 71 games for the Sabres. The 6-0, 191-pound forward has played in 208 career NHL games with Atlanta and Buffalo collecting 44 goals and 44 assists for 88 points along with 129 minutes in penalties. In the AHL, MacArthur led the Rochester Americans in scoring during the 2006-07 season with 63 points (21 goals, 42 assists) in 51 games and participated in the 2007 AHL All-Star Game. As a junior, he won the WHL championship with the Medicine Hat Tigers in 2004, and was named to the Memorial Cup All-Star Team. Internationally, MacArthur won a gold medal with Team Canada at the 2005 World Junior Championships, and a silver medal with Team Pacific at the 2002 World Under-17 Challenge. MacArthur, a native of Lloydminster, Alberta, was originally Buffalo’s third choice, selected 74th overall, in the 2003 NHL Entry Draft.